Renton RFA responded to 1,522 incidents during the month of February 2019. Below are details on the most significant incidents that occurred throughout the month. On 2/1/19 Renton RFA responded to a building fire in Station 17’s area at the 18100 block of 168th Way SE in Fairwood. We responded in conjunction with Kent FD and Maple Valley FD with 1 engine, 1 ladder truck, 1 aid car and 2 officer rigs for a total of 10 personnel from stations 11 and 17. The cause of the fire was undetermined at the time of the incident. There were no injuries from this fire and no one was displaced as a result of the fire. On 2/7/19 Renton RFA responded to a building fire in Station 14’s area at the 500 block of Stevens Ave SW. We responded in conjunction with Tukwila FD and Skyway FD with 3 engines, 1 ladder truck, 1 aid car and 2 officer rigs for a total of 16 personnel from stations 11, 13, 14 and 15. The cause of the fire was undetermined at the time of the incident. A resident got a small laceration on their hand from getting the fire extinguisher to attempt to put out the fire. Otherwise there were no other injuries. The cause of the fire was undetermined at the time of the incident and no residents were displaced. On 2/8/19 Renton RFA responded to a building fire at the 2800 block of Southcenter Blvd in Tukwila. We responded in conjunction with Tukwila FD with 1 engine, 1 aid car and 1 officer rig for a total of 6 personnel from stations 13 and 14. The cause of the fire was undetermined at the time of the incident. And there were no injuries as a result of this fire. On 2/9/19 Renton RFA responded to a building fire at the 700 block of S 125th St in Skyway. We responded in conjunction with Skyway FD and Tukwila FD with 1 engine, 1 ladder truck and 2 officer rigs for a total of 8 personnel from station 11. The cause of the fire was undetermined at the time of the incident. There were no injuries from this fire and no one was displaced as a result of the fire. On 2/15/19 Renton RFA responded to a building fire at the 20900 block of 125th Ave SE in Kent. We responded in conjunction with Kent FD with 2 engines, 1 aid car and 1 officer rig for a total of 9 personnel from stations 13 and 17. The cause of the fire was undetermined at the time of the incident. There were no injuries from this fire and no one was displaced as a result of the fire. 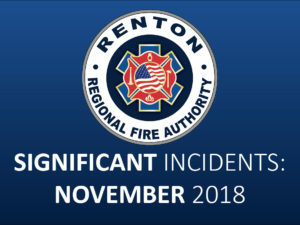 On 2/20/19 Renton RFA responded to a mobile home fire in Station 16’s area at the 15200 block of Oak Drive in the East Highlands. We responded with 3 engines, 1 ladder truck, 1 aid car and 2 officer rigs for a total of 16 personnel from stations 11, 15, 16 and 17. There was no injuries as a result of the incident. And no residents were displaced. On 2/21/19 Renton RFA responded to a building fire at the 6900 block of S 123rd St in Skyway. We responded in conjunction with Skyway FD, Tukwila FD and King County Medic One with 3 engines, 1 ladder truck and 2 officer rigs for a total of 14 personnel from stations 11, 12 and 14. The cause of the fire was undetermined at the time of the incident. On 2/26/19 Renton RFA responded to a building fire at Distant Land Coffee at the 800 block of Houser Way in Downtown Renton. We responded in conjunction with Skyway FD, Tukwila FD and King County Medic One with 3 engines, 1 ladder truck, 1 aid car and 2 officer rigs for a total of 16 personnel from stations 11, 12, 13 and 16. Employees were able to safely evacuate the warehouse and roasting plant. The cause of the fire was the accidental mechanical failure of the coffee roaster in the warehouse. The fire was contained to the roaster and ductwork from the roaster in the warehouse. There were no injuries as a result of the fire. 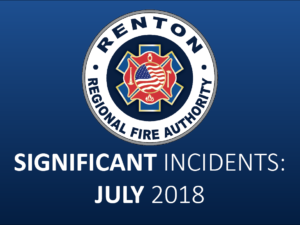 On 2/15/19 Renton RFA responded to a 2 car head on fatality accident in Station 14’s area at the intersection of SW Grady Way and Longacres Drive SW in the Renton Valley. We responded in conjunction with Tukwila FD and King County Medic One with 1 engine, 1 ladder truck, 1 aid car and 1 officer rig for a total of 9 personnel from stations 11, 14 and 17. The cause of the accident was undetermined at the time of the incident. There was one fatality as a result of the accident and 2 other patients with serious injuries transported to Valley Medical Center for treatment. 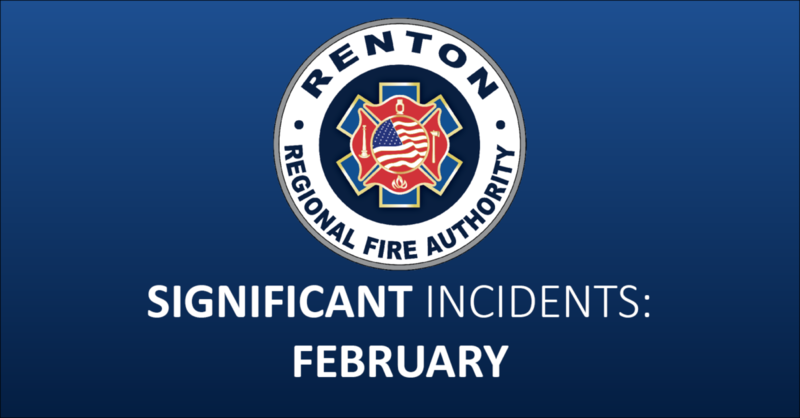 On 2/16/19 Renton RFA responded to a serious car versus pedestrian accident in Station 12’s area at the intersection of Union Ave NE and NE Sunset Blvd in the Renton Highlands. We responded in conjunction with King County Medic One with 1 engine, 1 ladder truck, 1 aid car and 1 officer rig for a total of 9 personnel from stations 11 and 12. The cause of the accident was undetermined at the time of the incident. There was one patient with serious injuries that was transported to Harborview Medical Center for treatment. On 2/19/19 Renton RFA responded to a suicide by gunshot wound in Station 16’s area at the 17400 block of SE 142nd St in the East Highlands. We responded in conjunction with King County Medic One with 1 engine, 1 aid car and 1 officer rig for a total of 9 personnel from stations 11 and 12. Resuscitation efforts were ultimately unsuccessful.